More proof that urban ag (gardening) is hot: I’m now getting tons of “grow bigger tomatoes” spam. Pacific Yachting magazine emailed me a few weeks ago to see if they could use one of my photos. They found the picture on Flickr, and contacted me to ask if I’d be willing to let them use it. The photo was from a September trip to Plumper Cove on Keats Island, and PY used it with of an article by Heather Lochner on nearby cruising destinations. That weekend, Plumper Cove was particularly spectacular – and we spent a good part of the weekend swimming off the boat and the small beach near the dock. It was one of those magic late summer weekends. We also ran into old friends Ron and Merideth, who’s boat features prominently centre frame of the shot. Many thanks to PY designer Arran Yates for selecting the pic. Took advantage of the late afternoon sun to buff and wax. Now it’s all bright and shiney. The sailboat that is. 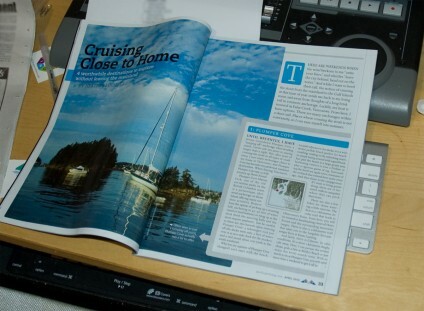 One of my photos taken at Keats Island is in this month’s (April) edition of Pacific Yachting. p. 32-33. whoohoo. Need Van dinner suggestions for friends in from Toronto – not super expensive but not bargain either – they like dining out and good wine. We have an owl in the woods behind our house in North Van. You’d never believe how LOUD they can be. Not complaining, but it’s – well – odd.